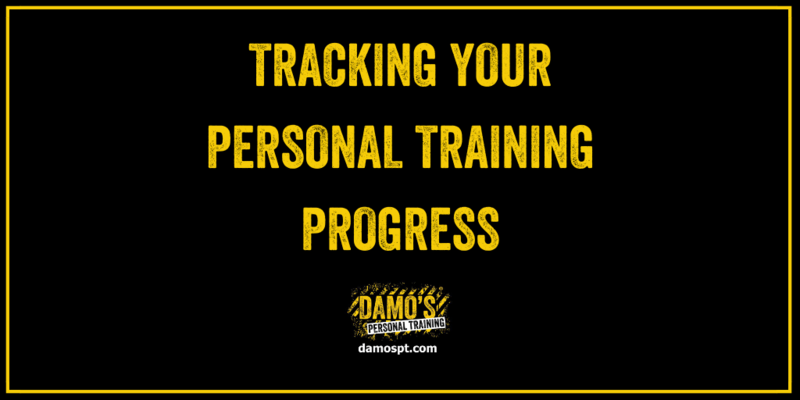 Whether you’re just starting out on your fitness journey and want to get ripped, or you’ve been training for a while and just want to lose a bit of body fat to get into peak physical shape, you shouldn’t forget a key piece of the puzzle – tracking your progress! 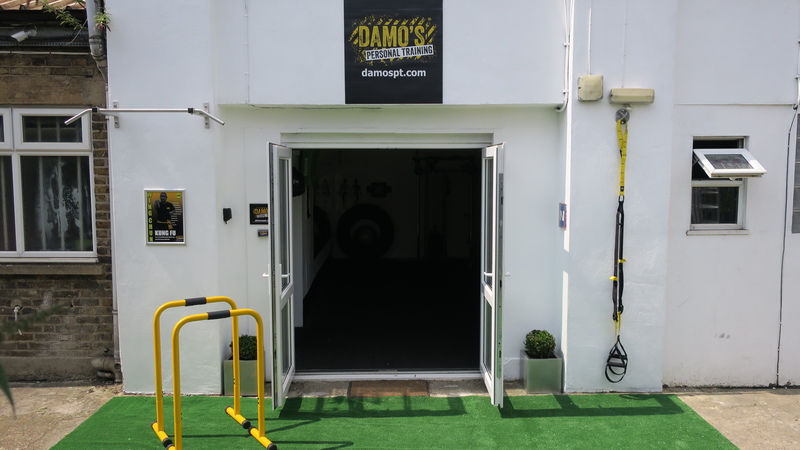 We all have personal training goals. A target weight. A one rep max bench press. A set of rock hard abs. Whatever your goals are, too many of us give up when we start to see our progress slow down. As you lose weight, it gets harder to lose weight. As you increase muscle, or up your cardio, it becomes harder to hit the next level. But what we’re often missing are the subtle changes. Progress slows down, but it doesn’t stop entirely – so, if we find ways to more accurately track this slow, steady progress, we’ll be more likely to stick to our goals! Weigh yourself daily. We recommend doing this in the morning, after going to the toilet but before eating breakfast. This will give you the most accurate weight possible. 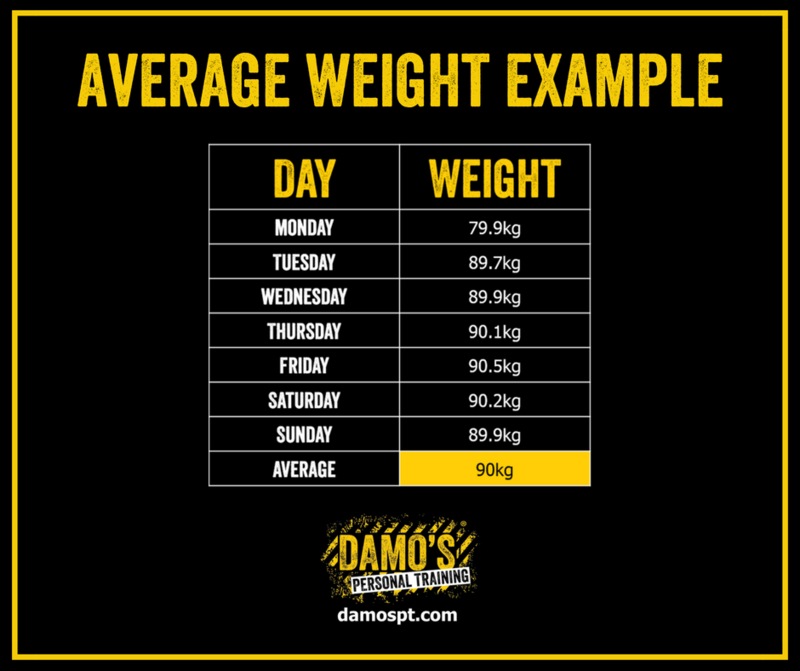 Once you have collected a week’s worth of weight data, add all of the daily weights together and divide them by 7 to find the average weigh-in for the week. 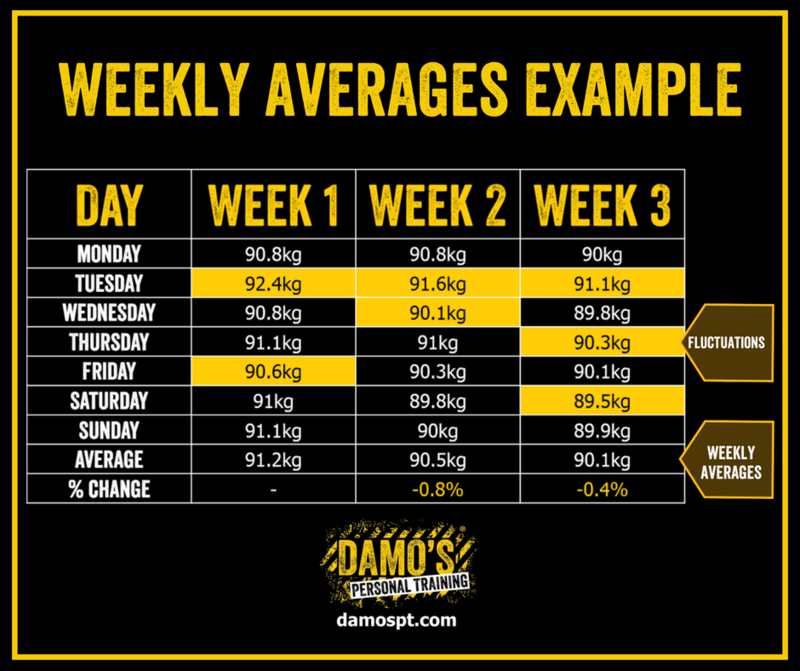 Even though the total body weight fluctuates from day to day, it is clear when measuring our weight in averages that the weekly averages are going down. This is called a downward trend and allows us to get a better overall picture of how progress is going. Take measurements once a week, at the same time as a weigh-in – so you’re under the same conditions. We have to live with ourselves all the time. Because we see ourselves in the mirror every morning and before bed at night, it can be difficult to notice small changes in how we look. Less fat, more body definition, or more muscle mass – whatever the changes, keeping weekly progress photos will also provide objective data. Make sure you take them at the same time as your weigh-ins and measurements. This will ensure it’s under the same conditions (so it’s more accurate), as well as being at the same time of day for each picture. Take the photos on the same day every week. Always use the same camera to take photos to ensure there are few fluctuations in image quality. A decent smartphone camera is good enough for the task. Take all progress photos in the same place, under the same lighting. Brighter lights or different lighting angles can make your body look different, so be careful! Following these steps will enable you to see how subtle these changes are, because you can compare photos directly week to week. Please note: checking yourself out in the mirror every day doesn’t count – but we definitely recommend doing it as well as you start seeing the difference! Part 3: Keep it up during training sessions! Firstly, make the best decisions about which foods to eat. Choosing the wholewheat equivalents of rice, pasta and bread will keep you fuller for longer, as they release energy slower and keep you going. Many types of beans, such as kidney beans or chickpeas, contain loads of protein. Filling up on vegetables gives you more bang for your buck – studies have shown that eating a green salad of 150 calories or less enhances feelings of fullness and reduces the total number of calories eaten during the meal by around 55 calories. Plus, 150 calories of salad is considerably bigger than, say, 150 calories of chocolate – and it will fill you up like it, too! 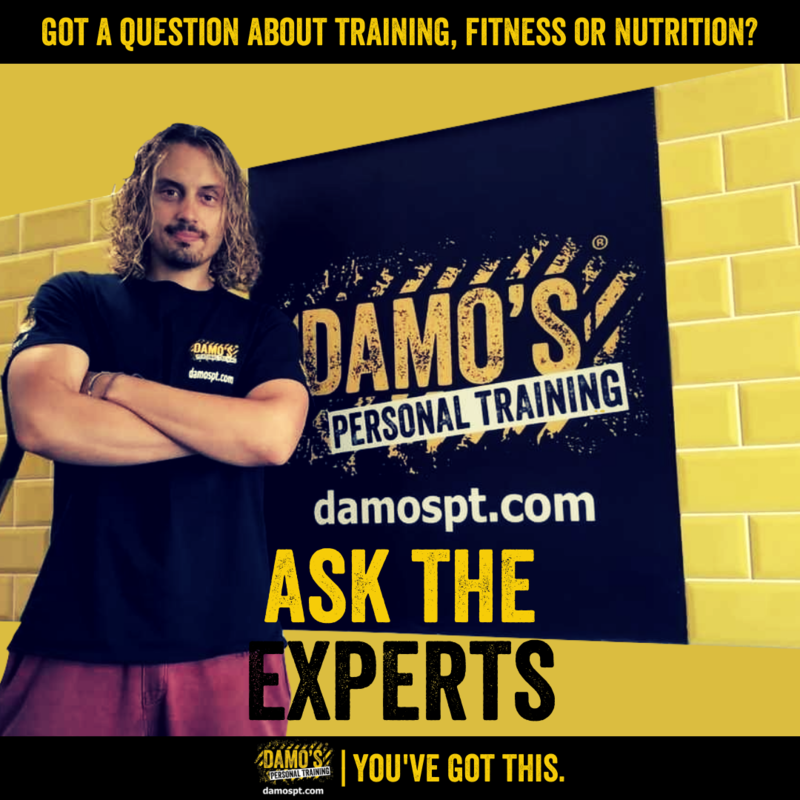 Secondly, it’s worth remembering that your training should complement your diet, and vice versa. If you’re eating fewer calories to lose weight, your goal shouldn’t be about setting new personal bests every week. Your goal is more likely to be maintaining as much strength and muscle as possible. 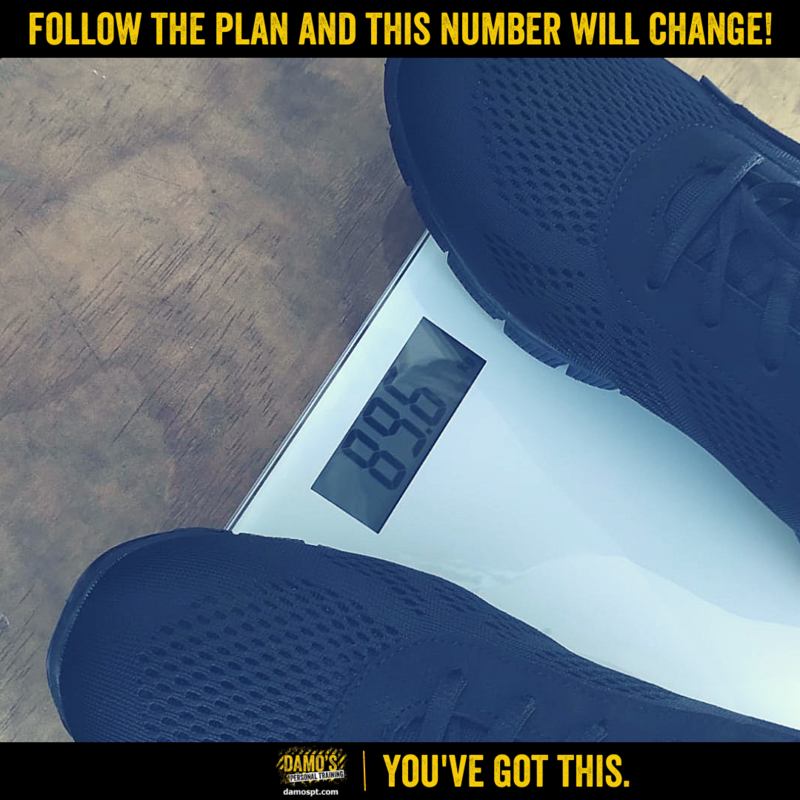 Tracking each training session with your personal trainer will allow you to both see when this is happening, meaning we can work together to make adjustments to your diet, or to each session.